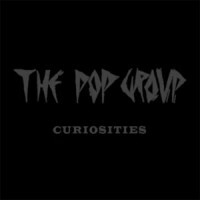 After spending over a year collating original singles, albums and previously unreleased studio and live recordings, the Pop Group have created a limited box set containing albums 'We Are Time' and the brand new compilation 'Cabinet Of Curiosities' + 36 page perfect bound book + bookmark + badge. 'We Are Time', named after one of their most infamous onslaughts was originally released on vinyl in 1980 a nd has been remastered from original tapes becoming available on CD for the first time and also reissued as limited vinyl. Of the early live and studio recordings that comprise 'We Are Time', frontman Mark Stewart says "We Are Time is really 'the' teenage Pop Group album. It's full of defiance and the material demonstrates the band's staunch independence and our really early DIY ethic before the studio became another instrument." 'Cabinet Of Curiosities', the nine-track compilation includes the fractured future-funk single "Where There's A Will," described by Sager [guitar] as "The group's best attempt to mix a message with a groove plus some real free playing. If you are really unhinged you may be able to dance to this." Also included is the original previously unreleased version of "She Is Beyond Good And Evil," probably the band's most infamous song. The set continues with BBC John Peel session tracks "We Are Time" and "Words Disobey Me," and rounds up previously unreleased songs, "Abstract Heart" and "Karen's Car," and other alternative versions. The Pop Group was born in Bristol in 1977 out of a disenchantment with punk failing to bust out of its rock origins. With mystical fire, enraged by global injustices, the group delivered scathing political and society-indicting messages aboard a post-apocalypse rollercoaster, ferociously straddling their beloved free jazz, conscious funk, heavyweight dub and audacious experimentalism. "It's one of those moments when the cogs of your mind shift and your life is going to irreversibly change forever" - Nick Cave on hearing The Pop Group for the first time.